From the tiniest hermit crab to the rare tufted puffin, the Oregon coast has wildlife enough to satisfy any visitor's interest. Up and down the coast, an abundance of National Wildlife Refuges give sanctuary to a variety of animal life. 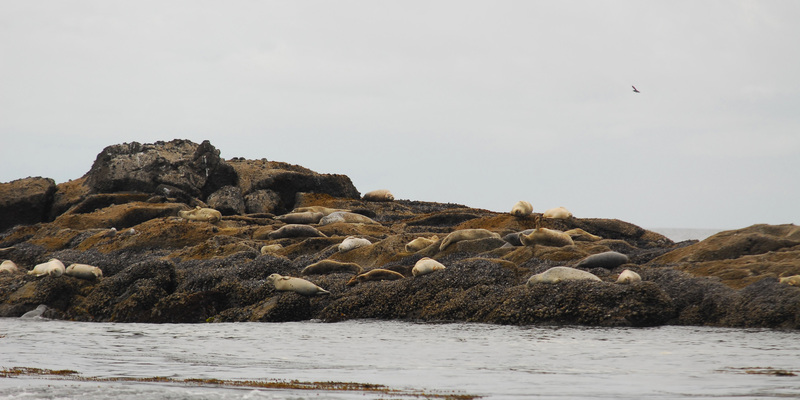 Hundreds of rocky islands provide nesting grounds to migrating birds and resting places to seals and sea lions alike. Depending on the time that you visit, you may see the graceful spout of a migrating gray whale or be deafened by the raucous barking of a colony of seals. Take your time as you move down the coast to explore all the different animals available to view here. With plenty of informational signs and visitor centers, you'll soon be recognizing the distinctive creatures that call Oregon home. As you enjoy the wildlife along the coast, please remember that you are a guest in this incredible and delicate habitat. Always give wildlife space; when an animal moves because it is uncomfortable with your proximity, it is using valuable energy that it may not be able to spare. And while it may be tempting to get a closer look at the wildlife on sea stacks and refuge islands, these are strictly off limits for humans, not to mention dangerous. It is best to skip the ticket or the injury and bring binoculars, a spotting scope, or a telephoto lens to get close to the action. Tide pools at Yaquina Head Outstanding Natural Area. Photo by Tyson Gillard. In 1805 Fort Clatsop was built on this spot following the recommendations of the Clatsop people. A 2.7-mile interpretive trail through the boggy banks of the Netul River gives bird lovers access to great blue herons (Ardea herodias) and other nesting waterfowl right up close. River otters splash and bald eagles soar over this quiet stretch of river. Both the Clatsop natives and Lewis and Clark referred to the river, which originates just south of Saddle Mountain, as the "Netul," but in 1925 the name was changed to the Lewis and Clark River. Today, not to completely confuse visitors, you will see signage using both names. Fort Stevens served as a military base from the Civil War to World War II, seeing 84 years of active operation beginning in 1863. Fort Stevens has the distinction of being the only military installation on the U.S. mainland to have been attacked in World War II, when it was shelled by an Imperial Japanese submarine on June 21, 1942. Now one of the busiest summer destinations spots on the coast, the 4,200-acre park has plenty to offer when it comes to wildlife. Brown pelicans (Pelecanus occidentalis) and sooty shearwaters (Puffinus griseus) are some of more recognizable seabirds present. Canvasbacks (Aythya valisineria) and other ducks find plenty to eat in the variety of waterways scattered through the park. With freshwater lakes, estuaries, rivers, and coastal beaches, this park has it all when it comes to bird habitat. Some of Oregon's largest mammals, both onshore and off, can be viewed around Cape Meares Lighthouse. Roosevelt elk (Cervus canadensis roosevelti) and Blacktail deer (Odocoileus hemionus) graze around the cape, while gray whales (Eschrichtius robustus) spout and sea lions (Otariinae) lounge on the rocks offshore. Common murres (Uria aalge) nest on these rocks as well. Three Arch Rocks National Wildlife Refuge, the first of its kind west of the Mississippi, can be viewed just to the south of the cape here. The refuge is home to Oregon's largest seabird nesting colony, including more than 100,000 nesting common murre and the largest colony of the iconic tufted puffin (Fratercula cirrhata). The refuge is also a pupping site for the federally protected Steller sea lions (Eumetopias jubatus), the larger of the two types of sea lions found on the Oregon Coast. High-powered binoculars or a telescope are a necessity, however, because the rocky islands are a half-mile out at sea and completely restricted to all human activities; even boats must remain 500 feet away. On shore, information stations are abundant, so come with a bit of extra time and an appetite to learn about the local wildlife and the history of the lighthouse itself. Gray whales feed closer to shore during spring migrations, making it much easier to see them here. June through October also provides a chance of seeing humpback whales (Megaptera novaeangliae) and blue whales (Balaenoptera musculus). Bald eagles soar over the beaches as common murres raise a ruckus in their nesting colonies. Quiet observers can also see huge Roosevelt elk grazing nearby. The Tillamook Rock Lighthouse that is visible offshore is listed on the National Register of Historic Places and is also part of the Oregon Islands National Wildlife Refuge. Stretching 9 miles between Cannon Beach and Seaside, Ecola State Park offers plenty of room for exploration. Quite possibly the best place on the Oregon coast for whale watching is in Depoe Bay. Resident gray whales return in March and stay through October. Spring whale migrations add to the numbers as the large mammals move closer to within a half mile of shore to feed. Mornings give the best opportunity for spotting spouts. As the day progresses, the wind increases and makes it difficult to spot the tell-tale blows. Humpback and blue whales can also be seen here. The Whale Watching Center is open from 10 a.m. to 5 p.m. during the summer season (Memorial Day to Labor Day) and 10 a.m. to 4 p.m. during the winter season for additional information about the large animals. 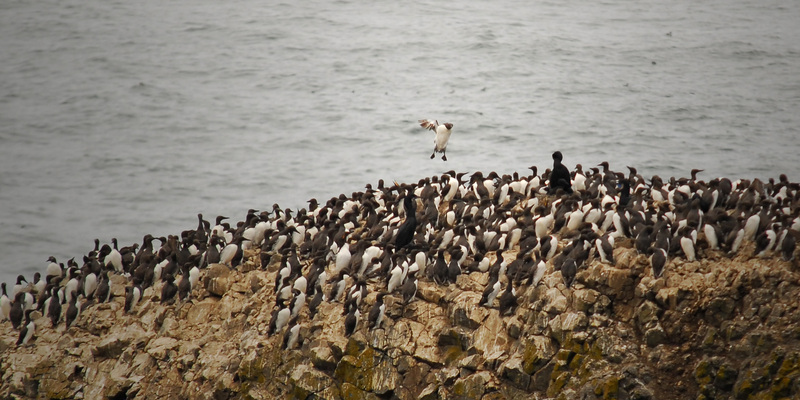 One of the largest common murre colonies in Oregon sits at Yaquina Head Outstanding Natural Area. This spot is best for bird lovers because black oystercatchers (Haematopus bachmani) race the waves and brown pelicans soar over the surf. In the winter, loons, grebes, and even the reclusive marbled murrelet (Brachyramphus marmoratus). 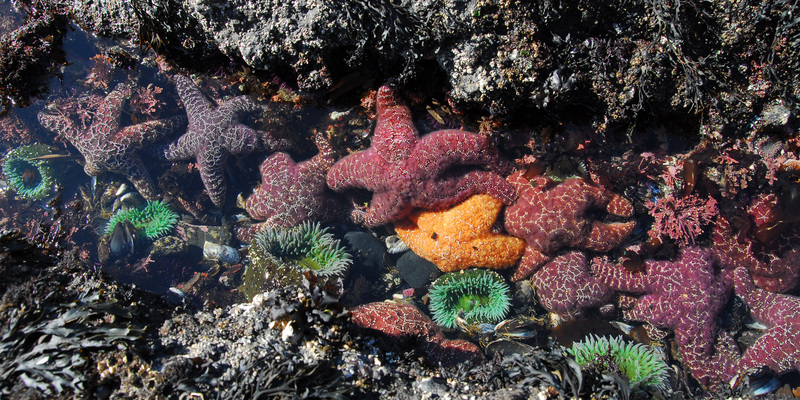 For families, some of the best tide pools on the coast are at Yaquina Head as well. Considerate tide pool exploration keeps these delicate animals safe and preserves them for future visitors. A common murre (Uria aalge) trying to make a landing. Photo by Tyson Gillard. The largest of the four subspecies of elk in North America can be found just outside the small town of Reedsport, Oregon, along the Umpqua River. A herd of roughly 100 Roosevelt elk call these meadows home year round. To learn more about these large animals, a stop at the O.H. Hinsdale interpretative center is useful for visitors. The 1,040-acre area offers two viewing areas with restrooms and parking available. If the elk are not easily viewable from these locations, it's common for people to pull off on the narrow shoulders of the highway to get a closer view of the herd when they come upon them. Beyond the elk, beaver, muskrat, Canada geese and waterfowl can be seen here as well. Cape Arago State Park brings the noise of thousands of seals and sea lions to visitors' ears. From the observation point atop the headland's highest point, there are great views of Simpson Reef and Shell Island to the north. To the south, Coquille Point and Cape Blanco are visible. If you are seeking relief from the frequent winds, Cape South Cove is excellent for tide pool exploration. In the spring, Northern Elephant Seals (Mirounga angustirostris) are frequent visitors to this area. A variety of birds ranging from Harlequin Ducks (Histrionicus histrionicus), Black Turnstones (Arenaria melanocephala), and a mix of scoters are also available for bird seekers. Some of the best available views into Oregon Islands National Wildlife Refuge can be found at Coquille Point and Kronenburg County Park. This particular area is bursting with bird life; watch for murres, cormorants, petrals, and tufted puffins, depending on the season. 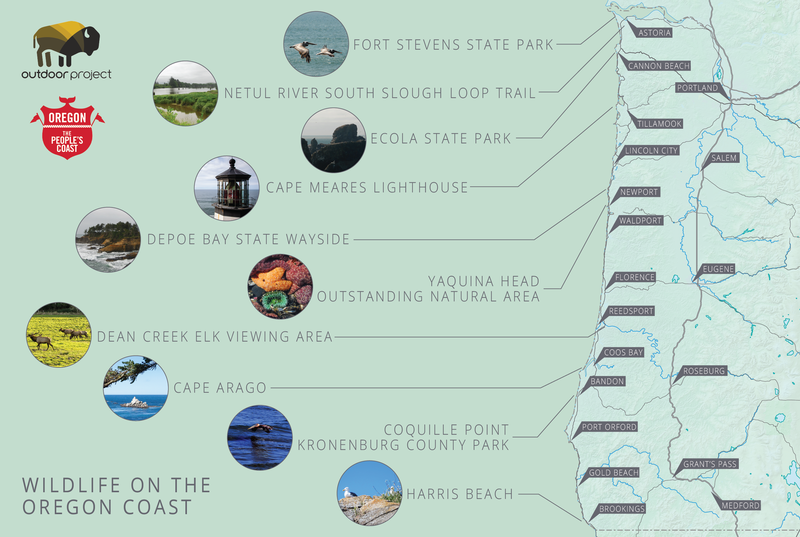 The entirety of Coquille Point is included in this NWR along with Table Rock, and Kronenberg County Park functions as a neighboring viewing platform, complete with interpretive signs that explain the unique populations that inhabit the area. Red-throated loons (Gavia stellata), Caspian terns (Hydroprogne caspia), and horned grebes (Podiceps auritus) are just some of the gorgeous birds that visit here. Whales can also be seen in good quantity in Port Orford year round. The dense kelp and algae beds of Port Orford Bay provide ample food for the California gray whales that spend time in the area, so great views can be had from Battle Rock Park facing the bay. Late summer is the best time for visitors to catch sight of these giant mammals. The whales are most active here July through September, according to the Port Orford tourism website. Oregon State University researchers have been studying these whales to better understand why they shorten their migration to remain in the waters off the Oregon coast. According to the OSU research team, one reason may be the copious amounts of mysid shrimp in the waters during the summer months. Whatever the reason, glimpses of these massive wild animals offshore is sure to provide a thrill for beach-goers. The largest island off the Oregon coast is located here at Harris Beach. Bird Island (also called Goat Island) is a National Wildlife Sanctuary where rare birds such as the tufted puffin breed. Numerous sea stacks, tide pools and panoramic views up and down the coastline make for a stunning visit to this southern beach. Harbor seals and California sea lions bark, and gray whales migrate along this area in both the winter and spring. In spite of the small size of the nearby city of Brookings, Harris Beach sees nearly a million visitors each year. It's a popular destination for good reason. Birders appreciate the Allen's hummingbirds (Selasphorus sasin), wrentits (Chamaea fasciata), and chestnut-backed chickadees (Poecile rufescens) that can be found here. We believe good things come from people spending time outside. It’s about more than standing on the mountain top. It’s about nourishment and learning. It’s about protecting what sustains us. It’s about building relationships with the outdoors and each other. LEARN MORE and share the pledge to Adventure Like You Give A Damn.